Would You Do Your Banking at the Post Office? Could your bank teller go postal? Offering basic consumer banking services in the form of prepaid debit cards is just one of many ideas the U.S. Post Office is considering to boost its bottom line. The government agency is in desperate need of revenue and raising the price of stamps -- to 45 cents for a letter starting Jan. 1 -- is hardly enough. 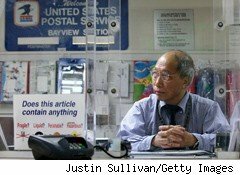 Annual losses for the post office could reach $16 billion a year by 2016 unless Congress passes legislation that allows it to branch into other business activities, The Wall Street Journal reported. The post office could also make money by offering diverse services, such as leasing its trucks to the private sector, acting as an operations consultant for retail shipping, or selling non-postal goods among other ideas, the Journal reported. But expanding on a service it already provides -- offering basic bank transaction services -- could be a boon to millions of underbanked Americans. A report from the Post Office's Office of the Inspector General earlier this month suggested that the independent government agency move into the prepaid debit card business. A U.S. Post Office spokesperson said that the organization is considering the recommendation, but hasn't made a decision. Offering prepaid debit cards could help the growing number of low-income Americans who could find themselves marginalized by the rising fees at retail banks. With one in three people willing to change banks over fees, there are signals that many consumers are looking for new alternatives to their banks. The post office already offers basic transactions like check cashing and money orders and prepaid debit cards would be a natural evolution for the institution. Add to that, the increasing emphasis on electronic payments. Both the government and employers are moving toward direct deposit for all payments, while many companies are channeling customers into paperless billing. Would you use the Post Office as a bank if it offered reloadable and prepaid debit cards? We want to hear from you. Catherine New can be reached at catherine.new@huffingtonpost.com.